It seems like there are countless definitions of evil, and so the goal of this chapter is not a comprehensive and broad survey. Instead, the purpose is to provide the reader with a sense of the possible tensions when trying to delineate what might be evil. This chapter begins with a discussion of evil as a category of description, noting some of the variations possible. Next, there is an exploration of Immanuel Kant’s radical evil, and then, an engagement with the concept of wétiko that is present in many Indigenous cultures. 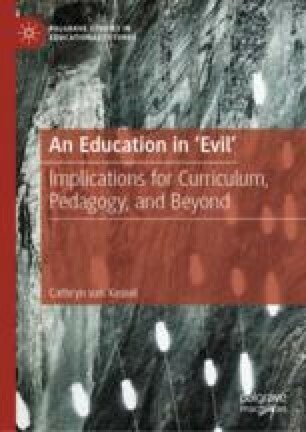 In the latter part of this chapter, defining evil is further complicated through how some popular film and television series can blur the distinction between good and evil, thus providing an opportunity to see evil on a spectrum rather than a specific category. Calder, T. (2018). The concept of evil. In E. N. Zala (Ed. ), The Stanford Encyclopedia of Philosophy (Fall 2018 Edition). Retrieved from https://plato.stanford.edu/archives/fall2018/entries/concept-evil/. Obie, B. (2018, February 17). In defense of Erik Killmonger and the forgotten children of Wakanda. Shadow and Act. Retrieved from https://shadowandact.com/erik-killmonger-forgotten-wakanda. Serwer, A. (2018, February 21). The tragedy of Erik Killmonger: The revolutionary ideals of Black Panther’s profound and complex villain have been twisted into a desire for hegemony. The Atlantic. Retrieved from https://www.theatlantic.com/entertainment/archive/2018/02/black-panther-erik-killmonger/553805/. Williams, D. (2018, August). Three theses about Black Panther. The Journal of Pan African Studies, 11(9), 27–30. Retrieved from http://www.jpanafrican.org/docs/vol11no9/11.9-special-5-Williams.pdf.